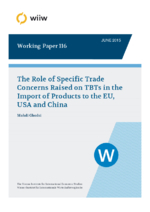 The Specific Trade Concerns (STC) data on Technical Barriers to Trade (TBT) notifications of WTO members report 317 TBT notifications between 1995 and 2011. This contribution provides evidence concerning the impact of TBT STCs on the imports of products at 4-digit level of the Harmonised System to three major economies – the EU, the United States and China – over the period 1995-2011 using an augmented gravity model controlling for the endogenous characteristics of TBTs and tariffs. Robustness checks are provided using Fixed Effect (FE) Estimation, and Poisson FE. Further, since TBTs are generally imposed on non-food products, food and non-food products are analysed in separate specifications. Bootstrapped robust results suggest that these policy measures have negatively influenced trade flows to the EU and China, while they have enhanced the imports of products to the United States. The quality impact of these measures is assessed using unit values of imports. The results suggest that US notifications improve the quality and values of imports, while in the case of the EU notifications this effect is observed only for the high-income trade partners. Lower imports to China due to quality improvement of products, on the other hand, may refer to low preference of Chinese consumers for higher quality.